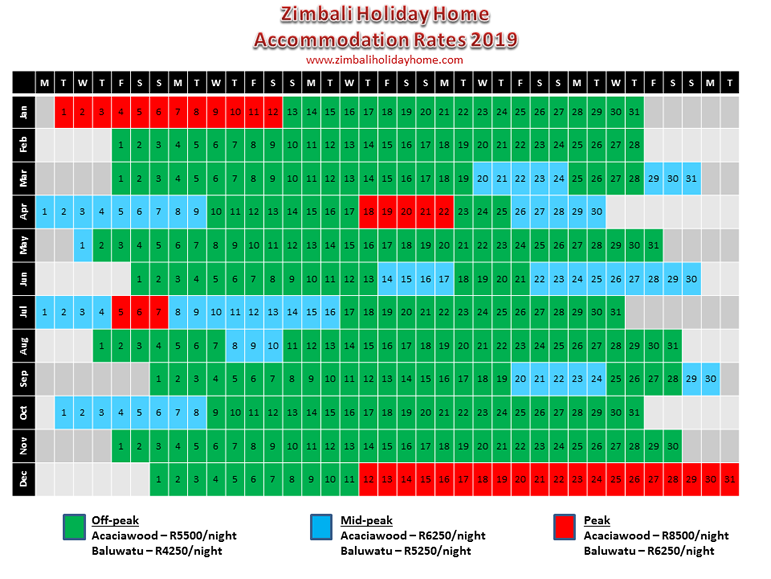 Accommodation rates at Zimbali Holiday Home are different during the various parts of the year due to demand (i.e. peak, mid-peak, and off-peak). During all periods guests are required to stay at least 2 nights. Special prices may be negotiated for guests staying for 7 nights or longer. There are currently no specials available, however, special rates can be negotiated for accommodation periods of 7 days or more. Please note that a refundable breakage deposit fee (between R 2 000-00 to R 5 500-00) is also required to stay at Zimbali Holiday Home. The breakage deposit covers any damages or losses that occurs during a guest's stay at the house, as well as any fines (traffic offences or other) which are acquired in the Zimbali Coastal Resort. The breakage deposit will be not be refunded if there are more than the maximum number of guests staying in the unit (i.e max 10 guests at 22 Acaciawood, and max 8 guests at 3 Baluwatu), or if person/s without a valid driver's license are found driving the golf carts. For further information read our terms and condtions. If you have any queries regarding availability, rates, etc. please feel free to contact us.